In this article, I want to look at crossover styling and show some tricks that Tesla used in styling the Model Y. These styling tricks allowed Tesla to design a very functional 7 seat crossover with 66 cubic feet of storage (with the 2nd and 3rd row folded) that still looks like a Model 3 to the average person. I have mixed feelings on this. Although I love the way the Model 3 looks, I think people looking for a crossover might want it to look more rugged than the Model Y looks. Also, as I’ve made very clear, I think seating 7 is very important to Tesla’s success in this market. I highlighted the black area around the fenders (notice the Model Y has that also). Also notice the sporty wheels on each car. But other than those similarities, the styling is different. The Rogue has a boxier front and rear area. Also, it has a roof rack and conventional door handles, while the Y has a smooth roof and the 3’s door handles, blacked out for extra sportiness. Nissan highlighted the Rogue’s 0.33 drag coefficient and its combined 28 MPG mileage in its 2016 press release. The Model Y’s 0.23 coefficient and expected economy of 111 eMPG thoroughly outclass the Rogue. I scaled the Model 3 mileage (took 0.9 times 123 because the Model X gets 90% of the mileage of the Model S). The Rogue’s 70 cubic feet of cargo area is similar to the Y’s 66. When I changed the color to white, I noticed the black area above the wheels almost disappeared. I think this is an optical illusion intended to trick your eyes into thinking the car has big wheel wells. So, why doesn’t Honda (or Tesla) just design the car with huge wheel wells? Because that would kill the fuel economy. Why does it want you to think it has huge wheel wells? Because it looks rugged and makes you think this crossover could handle some mild off-roading. The CR-V’s 76 cubic feet of cargo area is a bit more than the Y’s 66, but the CR-V only seats 5, versus the 7 the Y can seat. The AWD CR-V gets a slightly better combined 29 mpg, but the 2018 SUV of the year would be considered dog slow by Tesla standards at 7.5 seconds 0 to 60 mph for the AWD vs 4.8 for the Model Y. In this photo you can see they let you see the black around the wheels, but look at the imagery. Look closely and the road is quite smooth, but there are jagged rocks on the left and right and big mountains in the background. This is clearly designed to show you the car can take you out of the urban jungle. As far as stats, even though they bragged several times in their press kit a few months ago about how low their drag coefficient is, they didn’t release it. This brand new 5 seat SUV has a bit more cargo room at 78 cubic feet, but the mileage is atrocious at a combined 21 mpg for the AWD version. Honda is suffering from the gas design blues. In a gas car, you have to decide whether to design for efficiency or performance. You can’t have both. Someone who wants an efficient SUV would have to buy the CR-V above and live with the slower acceleration. Notice that if you upgrade to the Passport to get 5.8 0–60 mph acceleration, you not only pay an extra $10,000 for the car, but also will spend an extra $5,000 over the next 10 years fueling the car. The Model Y has an expected annual fuel cost of about $600 (10% higher than the Model 3 shown), giving a 10 year fuel savings of $13,000 over the brand new Passport and $8,000 over the “efficient” CR-V. You can read this 2019 test of the latest 5 seat crossovers and see how the Model Y will have a similar cost of ownership to these top midsized crossovers (which cost the same $40,000 to $50,000 as the Model Y, but the Model Y will get about 5 times the fuel economy, be dramatically better handling and much faster accelerating, seat 2 more people, and hold about the same amount of cargo). So, How Can The Y Look Just Like The 3, But Have Way More Room? If you look at the above photos and ignore the red lines, the cars look about the same. I drew the line to see how the Model Y could be so much more spacious without looking any different. The bottom line in each photo is just through the center of the wheels. Since the Y uses the same wheels as the Model 3, that gives us a baseline. Notice how in both photos, the door goes a few inches below the baseline, but in the Model Y, there is just black below the door. It is difficult to see where the car ends and the space underneath the car begins. That is probably intentional to trick you into thinking it has more ground clearance than it does. Notice the Model 3 has a few inches of white metal below the door. You can’t see it in the photo, but I went out to my Model 3 and verified there is an inch or two of black plastic below the body color even on the Model 3. You can see the Model Y fenders have both an inch and a half of black and an inch and a half of white around each wheel. The next red line I drew was along the top of the 19 inch tires. Once again, this should be a baseline, since the tires and wheels are the same on the two models. The next red line follows the crease in the door in each model. Here you can see a couple of things. First, it appears the crease slants up a little more on the 3 than the Y, but that isn’t important. What is important is that you can see that in the Model 3, the crease is only 3 or 4 inches above the top of the wheels and the door handles are a couple of inches above that. In the Model Y, there is at least 2 extra inches between the top of the wheels and the door handles. You don’t see it since the blacked out underbody and fenders trick your eyes, but with the red lines, you can see the extra height and where it is added. Also notice the side cameras are right on the crease with the Model 3, but below the crease with the Model Y. The next red line is at the bottom of the windows and I don’t see much difference between the area above the door handles to the windows between the 2 models. It appears the windows are about 9.5 inches above the top of the wheels in the 3 and about 13.5 inches in the Y, so there is about 4 extra inches hidden in this area. Look at the very back of each car and notice the Model Y is just above the red line and the Model 3 is just below the red line, that is about 2 inches of height (plus the other 4 inches mentioned before). So, it is likely that the back hatch is 6 inches higher than the top of the trunk in the 3 (which is already so high that I have trouble seeing over it looking back). Very few people would look at the Y and realize that the top of the hatch is 6 inches higher than the 3 (which is why I wrote this article). The next red line is at the top of the glass for each model. I measured the height of the B pillar on my computer screen on each car and the Model Y was an eighth of an inch taller — scaling using the know 19 inch wheels means it is just less than 2 inches more glass area. Looking at the dimensions of the Model S and Model X, Tesla made the Model X 7 inches taller, where it looks like to me that the Model Y is also about 8 inches taller than the 3. This agrees with Max’s article (although I did my calculations before reading his article). I expect they will had a little width to the 3 for the Y, simply because they did for the X compared to the S and a little width helps make the cargo capacity greater. 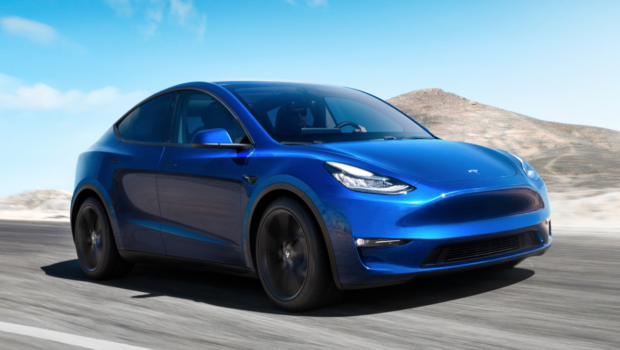 That 8 inches (plus the extra couple inches saved by not having a headliner) is why the Model Y can look like an exotic crossover but have as much room as a bulky looking SUV. Once again, Tesla changes the rules of the game. Leave it to Tesla to figure out how to copy Lamborghini’s look and beat it in performance, while beating or matching the Toyota’s Highlander’s affordability and seating capacity, and almost matching the cargo capacity (Highlander has about 12 cubic feet more cargo space). In short, if you could have the practicality of a Toyota Highlander with the looks and performance of a Lamborghini, who could say no? In this article, I tried to show some of the tricks Tesla used to give the Model Y the utility of an SUV but the looks of a sports sedan. These tricks are brilliant, but might backfire on Tesla. If the public gets how this vehicle lets a family have the best of an SUV and a sport sedan in one vehicle, it will be a great success! But if people see it as an expensive toy for the rich like a Porsche or a Lamborghini, regular people won’t even think to shop for the Model Y. Maybe friends and the referral program will get the message out. Maybe Tesla will have to resort to advertising. Time will tell. If you want to take advantage of my Tesla referral link to get 1,000 miles of free Supercharging on a Tesla Model S, Model X, or Model 3 (you can’t use it on the Model Y yet), here’s my code: https://ts.la/paul92237 (if another owner helped you more, please use their code instead of mine).